The chart shows the number of female students per 100 male students in primary, secondary and tertiary education. On Average, more boys than girls were enrolled in school both in 1990 and 1998 in all the countries, except in tertiary education in developed countries. The number of girls per 100 boys was bigger in 1998 than in 1990 in the two country groups and in all the educational stages. Turning to the detail, there were more boys than girls in primary and secondary education. As can be seen, developing countries saw a bigger discrepancy between the numbers of male and female students than developed countries, with the number of girls per 100 boys at 83 in 1990 and 87 in 1998 in primary education. However, in developed countries, the balance of the two was much closer to the ideal, particularly in secondary education, with 98 girls per 100 boys in 1990 and 99 in 1998. 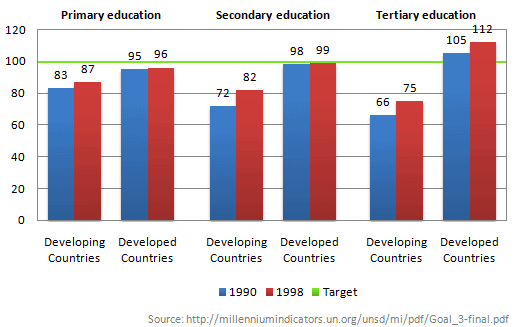 Regarding tertiary education, the balance was even worse than in any other levels of education in developing countries with 66 girls enrolled for every 100 boys in 1990 and 75 in 1998. On the other hand, in developing countries, the number of girls overtook that of boys at 105 per 100 boys in 1990 and 112 in 1998.